Launched in 2017, the Majestic Princess is one of the newest and largest ships in the fleet. Step on board and enjoy the shiny new amenities and fresh contemporary design. All the cabins on board the Majestic Princess are spacious and a grand 80% of them have balconies. 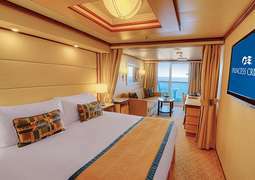 Whether you go with a value-for-money Inside Cabin, a Balcony Cabin with spectacular views or a luxurious Suite, you are guaranteed a good night's sleep on the supremely comfortable Princess Luxury Bed. The Majestic Princess is very well equipped in terms of entertainment: there is the adult-only 'Hollywood Pool Club'; the 'Bullseye' laser shooting range for teenagers and those still young at heart; the Princess trademark 'Movies Under the Stars' for film lovers; Zumba classes for sports enthusiasts and even a bubble tea kiosk...for everyone. 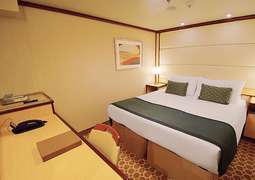 There is plenty more that makes the ship special - book and find out for yourself! 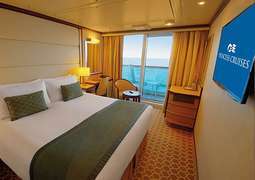 More than 80% of the Majestic Princess’ stylish and modern staterooms boast a private balcony. They welcome you with deluxe amenities, 24-hour room service and the Princess Luxury Bed - a custom-made mattress developed with the help of Dr. Michael Breus, the board-certified sleep expert recognized as 'The Sleep Doctor'. Menus throughout the ship feature expanded food selections from China, Southeast Asia and around the world, in addition to internationally inspired Princess dishes that you will love. Delight in the classic 'Crown Grill' steakhouse, as well as two new specialty restaurants exclusive to the Majestic Princess: 'Harmony' - serving Chef Richard Chen’s interpretation of classic Cantonese dishes and 'La Mer' - an authentic Parisian Bistro. There’s also the World Fresh Marketplace, where you can experience flavors from around the world at a variety of food stations. World-class entertainment can be found in all the beautiful venues featured on board the Majestic Princess. Sing along and dance to live musical performances, marvel at the costumes and sets of grand Broadway-style productions, be awed by talented illusionists and laugh at the side-splitting humor of top headliner comedians. In the evening, the top deck pools transform into a dazzling interactive sound and light show - Princess WaterColor Fantasy that is accompanied by dancing fountains that shoot water up to 10m into the night sky. Lady Luck and the Princess Casino invite you to try your hand at the latest slots plus your favorite games of chance, including blackjack, Texas Hold ’Em, and roulette. Treat yourself to a culinary demonstration, stroll the Fine Art Gallery and indulge in the 'Discovery at SEA' enrichment programmes, take a yoga class or relax during a hot-rock massage at the Majestic Princess' own 'Lotus Spa'. From sparkling pools to elegant jewellery in one of the many onboard duty-free shops, do as much as you want…or nothing at all.